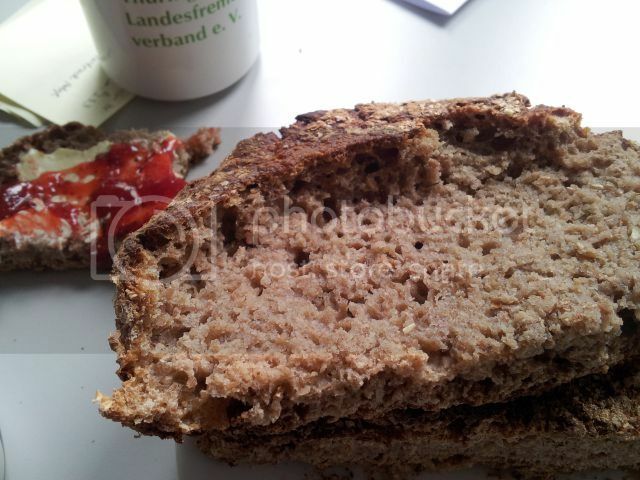 This entry was posted in Food, Recipes, Uncategorized and tagged Baking, Bread, Sour Dough by Cathy. Bookmark the permalink. I’m so glad you posted this recipe! I had copied it from the back of Michael Pollan’s “Cooked” before I returned it to the library, but have misplaced it (along with the other recipes from his book, unfortunately – wanted to try the sauerkraut next!) I too ended up with a very free-form product at the loaf-forming stage. I was so sure I had measured my ingredients wrong, that I added more flour to make it all hang to gather in a more traditional way, but didn’t really accomplish much. I poured the free-form dough into the two Le Creuset pots, and they never did rise very much (too much flour , I guess), but were dense and delicious. I will try your loaf pan method next time! OMG me too! Check out my posts “TBF” to witness my frustration and agony and “It’s alive!” to see my relief that the bread was viable after all! i have been following this recipe as i just got this book as a gift. unfortunately, i had a reading comprehension fail and did not start soaking the flours when i made the leaven last night. so….do i soak the flours tonight and bake tomorrow? if i do, should i “feed” the leaven today? how much? or should i forgo the long soaking time and work with the ready leaven today? thanks for your time. Sorry for my late reply. From what I understand from the recipe, soaking the flours relaxes the bran in the whole wheat flour and allows for more expansion by the bacteria. I would hazard the guess that using normal flour would not need soaking. If using whole wheat I would definitely soak the flour and maybe feed the leaven so it doesn’t totally collapse into itself if it runs out of food/becomes too sour. I had terrific results from this recipe the first time I made it, even though I accidently did not follow it precisely. I will use this as my main bread recipe forever. Thank you, Michael Pollan! Can you describe where you’re at a little bit more? Are you after the bulk proofing and the loaves have been shaped? For how long did you fold and turn? I had the best results by going back to the source and following Chad Roberston’s shaping methods. What if you just use the entire portion of the bread as the leaven but less moist and then wait for fermentation to take place? I have a very small oven and dont have a pot small enough to fit the loaf and the pot. Would I be ok if i placed the loaf directly in the oven? I think the reason dough is put in a pot is to stream it. Putting a pan of hot water or spraying water inside the oven might be a good alternative. Just a thought. Thank you for the detail. I had made my first bread with mixed reviews. I will try this method. Biggest problem with my bread was the crust was so hard I almost needed a machete to cut it. I’m guessing it was over cooked. This is great! I found it during my search for sourdough bread after watching cooked. I have a new blog and was going to post this same method of bread making! You don’t say how much starter you added. Can you please specify. THANKS! This is a great, and very informative, site. My question – Does the sourdough bread actually rise in the oven? I’m trying out this whole thing and my ‘normal’ bread doesn’t rise in the oven, [the stuff made with active dried yeast] it rises when its ‘set to rise’ but there isn’t any difference in the size from when it goes in to cook and when it comes out to cool. Does the sourdough actually get bigger? [i’ve just started yet another sourdough starter, and hope this one will have some ‘oomph’ to it – wish me luck]. Hi, My dough has risent a few times, and somehow it still continues to stick with my hand. How do you handle it? I have difficulty transferring from proofing basket to the baking container.